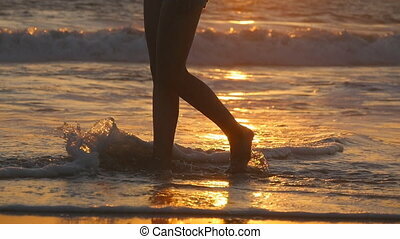 Female feet walking barefoot on sea waves at shore at sunset. legs of young woman going along ocean beach during sunrise. girl stepping in shallow water. slow motion close up. 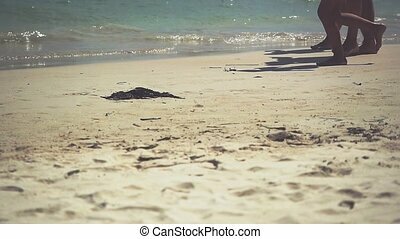 Point of view of young couple stepping together at the golden sand at sea beach. Male and female legs walking near ocean. Bare feet of pair going on sandy shore. Summer vacation. Handheld shot. 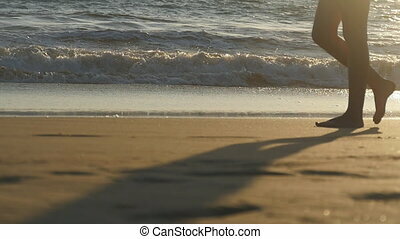 Girl in bathing suit runs along the sea shore at the beach. Slow Motion in 96 fps. Young Happy Girl goes on the sunny coast of the sandy beach on the Sea. Beautiful woman enjoying life on the resort. 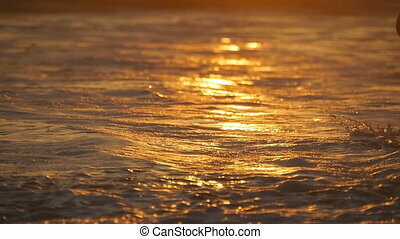 Sea waves splashing over female feet walking barefoot on shore at sunset. Legs of young woman going along ocean beach during sunrise. Girl stepping in shallow water. Slow motion Close up. 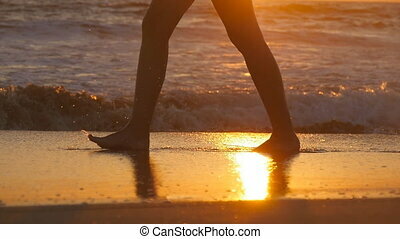 Sea waves splashing over female feet walking on shore at sunset. Legs of young woman going along ocean beach during sunrise. Girl stepping in shallow water. Summer vacation. Slow motion Close up. Female feet walking barefoot on sea shore at sunset. Legs of young woman going along ocean beach during sunrise. Girl stepping in shallow water at shoreline. Summer vacation. Slow motion Close up. Legs of young woman going along ocean beach during sunrise. 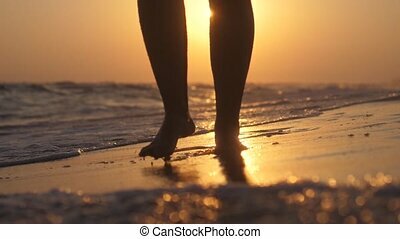 Female feet walking barefoot on sea shore at sunset. Girl stepping in shallow water at shoreline. Summer vacation concept. Close up. 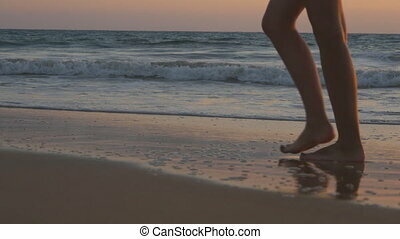 Female feet of hiker tourist walking barefoot on shore at sunset. Legs of young woman going along ocean beach during sunrise. Girl stepping on wet sand of shoreline. Slow motion Close up. Young woman in swimsuit and shirt going along ocean beach at sunset. Girl enjoying summer. Female walking on the water at the sea shore. Slow motion Close up. Legs of young woman traveler with backpack going along ocean beach during sunrise. 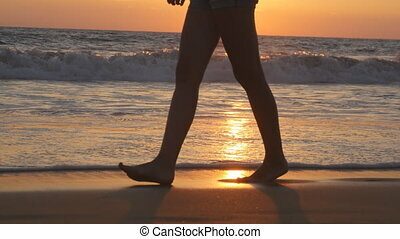 Feet of female tourist walking barefoot on sea shore at sunset. Girl hiker stepping during travel or summer vacation. Legs of young woman stepping at sand. 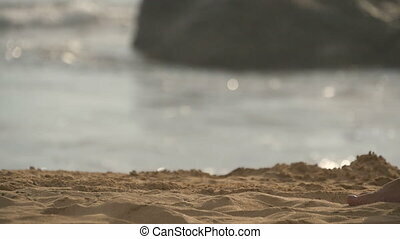 Close up of female feet walking on golden sand at the beach with ocean waves at background. Barefoot girl at the sea shore. Summer vacation holiday. Slow motion. 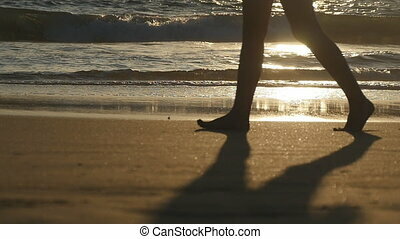 Close up of female feet walking on golden sand at the beach with ocean waves at background. Legs of young woman stepping at sand. Barefoot girl at the sea shore. Summer vacation holiday. Slow motion.